What is this, vegetarian on a FRIDAY? Such riff raff. It’s not my fault though. This post was actually supposed to go up Wednesday, but my laptop went wonk-a-lonk, so I had to take it into the shop-a-lop. I haven’t posted a thing since Monday! You didn’t notice, did you. It’s okay if you didn’t notice. No, no I’m fine, really. No, seriously it’s okay that you didn’t notice. Did I mention I’m packing four pounds of baby already? DUDES. I had a sonogram on Tuesday afternoon and they’re already almost two pounds each! Almost a week ahead in growth. I’m scared. Will you hold my hand? And my belly up so that I don’t fall over? Coo, coo, thanks. 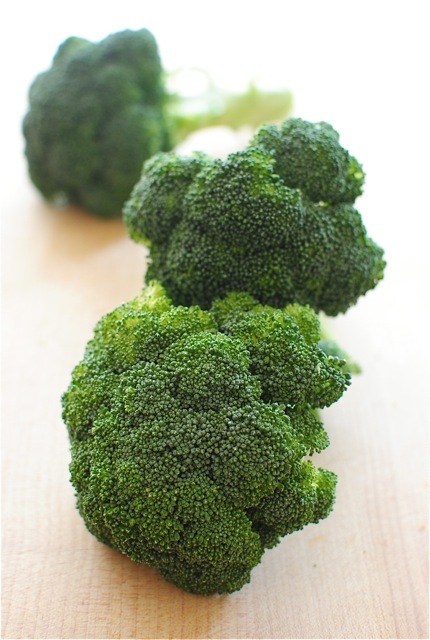 What I’m getting at is, I roasted some broccoli, potatoes and mushrooms a while back. All chopped up and roasted with some cinnamon and nutmeg. Doesn’t that sound so weird? What is even happening here? And THEN, at the same time, I roasted some grapes. Which I’ve done once before and haven’t been able to stop fantasizing about it. Buuuu-huuuuut this time I blitzed ’em up in a food processor with some honey and made a sauce. And the sauce blew my mind off and onto the floor. I garnished it with some lavender blossoms, but took them off immediately before eating because I read somewhere that pregnalillyloo women shouldn’t eat lavender because of botulism. Also! Try the roasted grape sauce on some grilled or roasted chicken. Take that baby for a ride. Whatever that means. 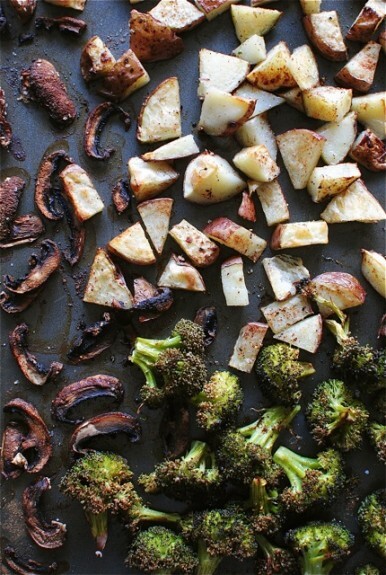 Arrange the vegetables on a large baking sheet and drizzle with oil. Sprinkle with the cinnamon and nutmeg. Toss a little salt and pepper over everything as well. 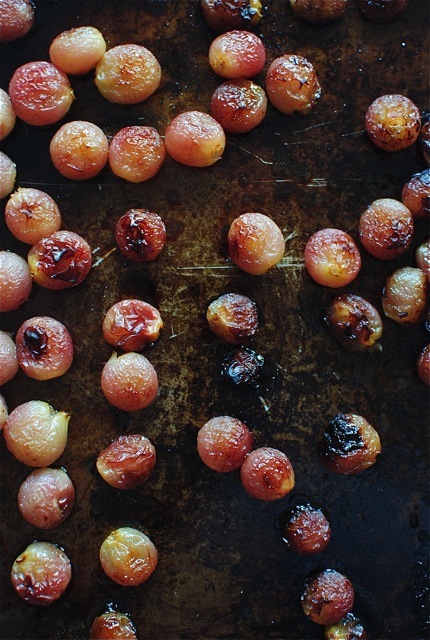 Arrange the grapes on a separate smaller baking sheet. Drizzle with a teeny bit of oil. Roast everything for 30 to 40 minutes, or until browned and roasted and tender and awesome. You may need to take out the grapes a little before everything else. Place the grapes in a food processor. Add the honey and blitz until smooth and luscious. 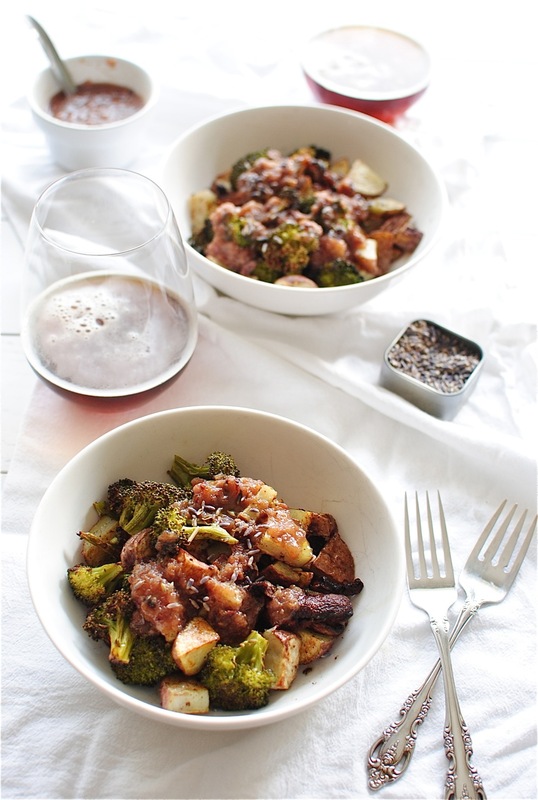 Serve roasted vegetables with the roasted grape sauce. Garnish with lavender blossoms, if ya want. Totally up to you. I’m just kidding about the botulism thing. This looks so good! And the grape sauce looks amazing! I totally noticed! I figured the babies were already siphoning off all your energy and you couldn't cook or write. Nice comeback! 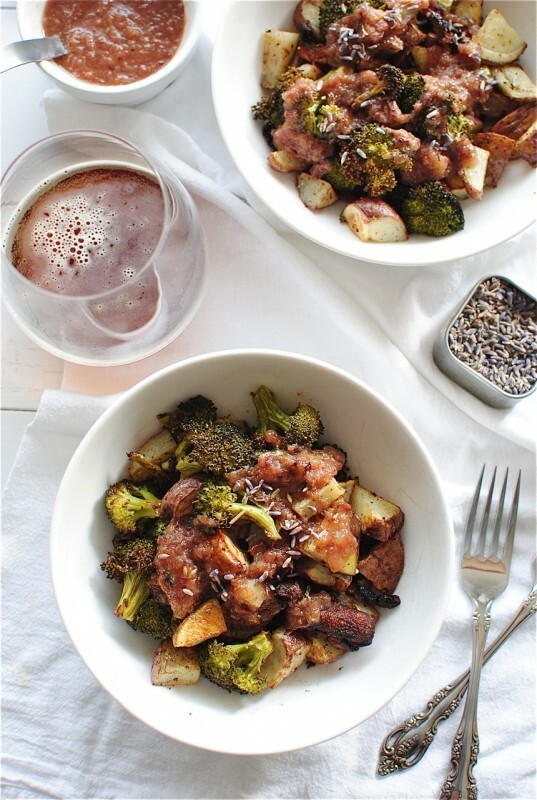 That grape sauce over the veggies sounds pretty freaking awesome to me! Perfect fall meal! Grape Sauce...who woulda thunk! I'm into it. I have never imagined grape sauce in a million years...but it looks like something that I should be trying! And, yay for healthy Fridays! Wow! Love this dish, Bev! Looks amazing!! I love this roasted grape sauce! I feel like I want to slather it on chicken and toast and well, everything! Glad you're back and broken computers are the pits! Hope that's all done now! MOMMY. Roasted fall veg is SO my jam. I can't wait to make this next week! This look amazing. Can't wait to try it. Looks so comforting! 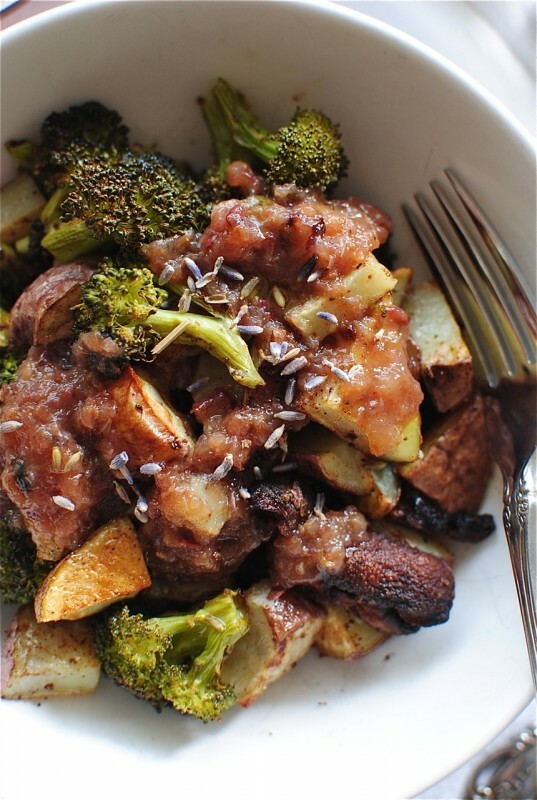 Love that creative and delicious roasted grape sauce! Grape sauce. Are you kidding me?! This looks tubular. I have to admit that at first I thought Ewwww. grape sauce? But I totally saved this recipe and am thinking about getting grapes when I go to the store. You win. OMG roasted grapes are the best thing ever. But I would have never thought of this! You are a genius my dear. I just hit my head on the screen. 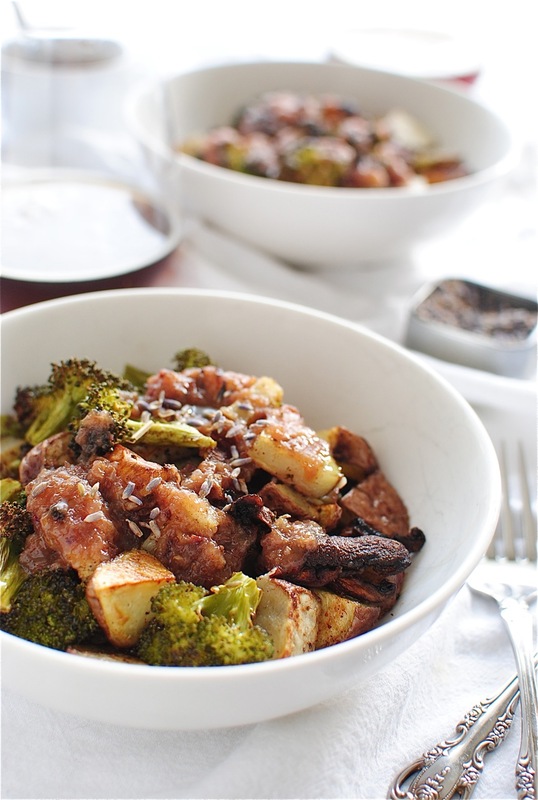 I just love roasted vegetables :) this grape sauce sounds perfect!! 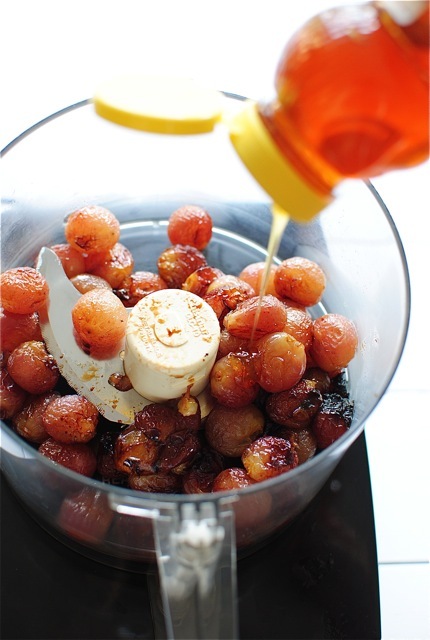 Roasted grape sauce! Brilliant, Bev.